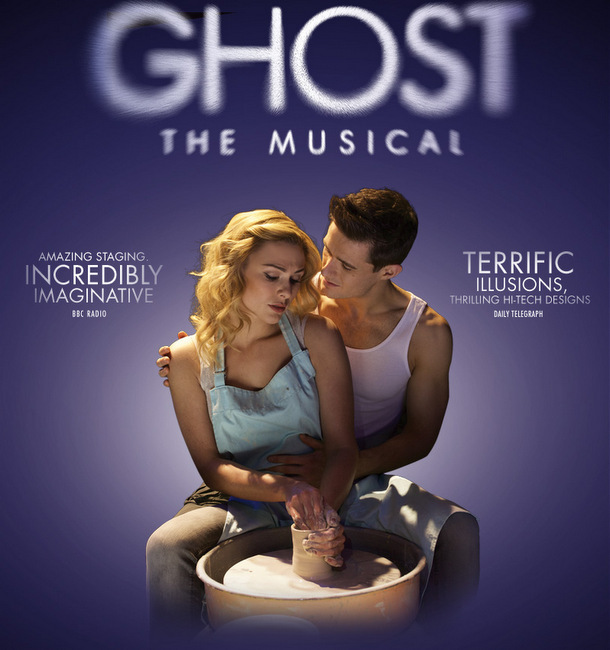 Ghost The Musical will play at the Mastercard Theatres from 4 November to 15 November 2015. It will star Liam Doyle and Andrea Laxton as Sam and Molly. Ghost, the iconic romantic film of the 90s, makes a comeback – not to the silver screen, but – to the stage! Following the same plot that catapulted Demi Moore and Patrick Swayze to swoon-worthy icons of the decade, Liam Doyle and Andrea Laxton will take on their roles of Sam and Molly in the Singapore rendition at the Mastercard Theatres at Marina Bay Sands. There, they will be enchanting us with a visual experience like no other from 4 November to 15 November 2015. We all know (or love) the movie, but could you give us a quick introduction to the show and your characters? Andrea: To start off, we have Sam Wheat (played by Liam) and Molly Jensen (by me). He is an investment banker, she is an artist. They are a couple who are so in love, so connected and about to start their lives together in the apartment they just bought. And, they have a best friend called Carl Bruner. Andrea: Best friend for now, exactly! Basically, everything was going great for them. Then, one night, after Molly’s showing, things take a turn for the worst. Spoiler alert – Sam was shot dead. He is then caught in between the idea of heaven and hell, where he is stuck because of unfinished business. That of which, is not being able to tell Molly that he loves her. That’s the main plot, but there’s so much to say about the show. 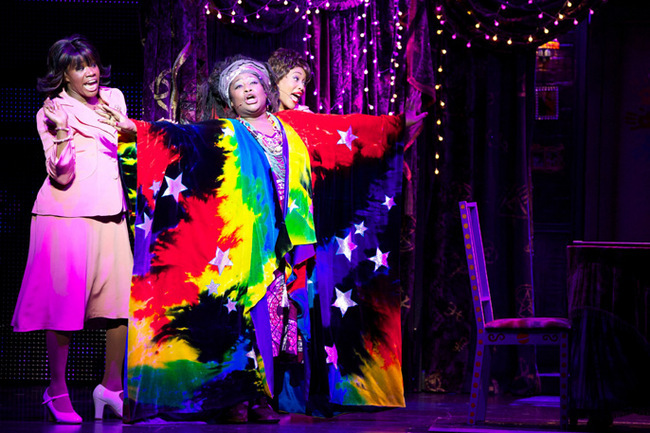 The really fun parts are the comedic bits thanks to Oda Mae Brown, originally played by Whoopi Goldberg and Wendy Mae Brown in our production – which is really similar to Oda Mae Brown! She’s the psychic, and Sam realises that she “can see and understand me”. He uses her to try and communicate with Molly; to keep her safe, get close and to say goodbye. It is wonderful story. Liam: It is a story about love, really. Most certainly. In most musicals, its like “Oh, I love You!” and “Yeaaaah”. But, this musical is about dealing with lost, and almost dealing with it in a positive way. There’s an amazing line in show at the very end, “There’s love inside and you take it with you.” It is a beautiful way of thinking about life. How close does the musical performance follow the 1990 movie? Liam: Bruce Joel Rubin, who wrote the script for the movie, also wrote the book for the musical as well. Its pretty much word for word, aside from a few subtle changes to get the information across on stage (compared to on camera). It has been an amazing piece to work on and I love it. It is one of the best musicals I have ever had the chance to work on. Andrea Laxton plays Molly (previously played by Demi Moore). How does it feel to play such iconic characters? Liam: We have already been doing it on tour around China and Asia for four months. We kind of feel like we own it a little bit now – which is good. We got over the pressure in the beginning, and, now, it’s just so much fun. I love it. It is a tiring, brutal and emotionally draining show. Are you really saying that with a smile!? Liam: I love it because it is so rewarding. Andrea: Really, it is so rewarding. At the end of the day when I take a bow; when we have really given everything we had. But, that’s why we do what we do. It is really a privilege to work on a show that allows you to push those boundaries physically and emotionally. And, people just leap up at the end, crying, laughing and clapping. It is a really magical experience – not one you can experience all the time in theater. So, we were really lucky to work on this piece. Liam Doyle plays Sam Wheat (originally played by Patrick Swayze). Ghost is an incredibly passionate love story. There is strong chemistry between the two main characters, so, how did the two of you get into your characters and their story? Liam: We are very lucky we get on together so well as friends. Playing opposite someone is actually very daunting. You are giving yourself to them. It is quite a scary experience at first, because you are realistically giving everything that you’ve got to that person. So, when you’re a bit nervous and your friend takes that fear factor out of it, you can just commit to it. Then. you just use the connection that you have. It doesn’t have to be romantic actually. We are actors, we pretend. We use the relationship that we have and build on it on stage. Liam Doyle walking through a door on stage. Credits: GWB Entertainment. 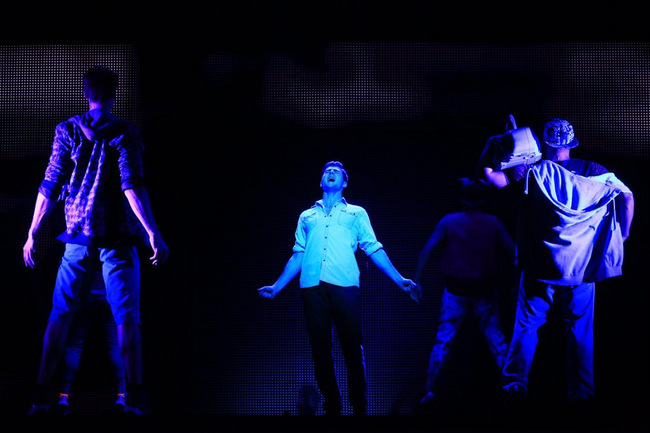 Looking at previous staging of the musical, I have noticed that Sam looks ghostly on stage! Seems like there’s a lot of illusions and effects going on stage. Would you be able to tell us a little more about what we could expect? Liam: Well! I am not allowed to tell you how I do it. But, it’s all thanks to Paul Kieve. He is the one who worked on Harry Potter, isn’t he? Liam: Yes! He worked on Harry Potter. Andrea: He is an amazing illusionist. Liam: He has worked out everything for the show. There are illusions in the show that have never been done anywhere else. We are very lucky to have Paul on-board. There’s this part where we get on the Subway in Act I with this angry subway ghost. He is such an angry character that when he punches the floor, everything starts moving. He had learnt to manifest his anger to actual physical movement. And, in that moment, everyone in the subway actually gets lifted off the ground! It is not something you would expect from a stage piece. Liam: No, not at all. In a movie, we have CGI, but you can’t do that in a theater. It is impossible, and you have to do it and repeat it over and over again. Paul has actually worked out ways to make it look like all the effects are happening and it is so impressive. Andrea: When I first saw the show when it was on Broadway (I was working on a different show at the time), I thought the ghosts were holograms! But, it would be like 10 million dollars or more just to pull that off technologically. It is really just actors, lighting and costumes combined with the work of illusions. There’s going to be walking through doors, or your hands passing through objects. Subway ghost from Ghost The Musical. Credits: GWB Entertainment. There is also one part in the Act II where a ghost jumps into Oda Mae’s body. We spent hours on that illusion alone just to make it believable that he enters her body, habits her, and speaks through her. You see this again when Sam goes into Oda Mae’s body. And, just like in the movie, you see Molly and Oda Mae dancing when its really Molly and Sam. The chemistry between Sam and Molly is actually translated through Oda Mae and Molly? Andrea: It is one of the most stunning and touching illusions in the show. One minute its Oda Mae and Molly dancing, and the next, its Sam and Molly. 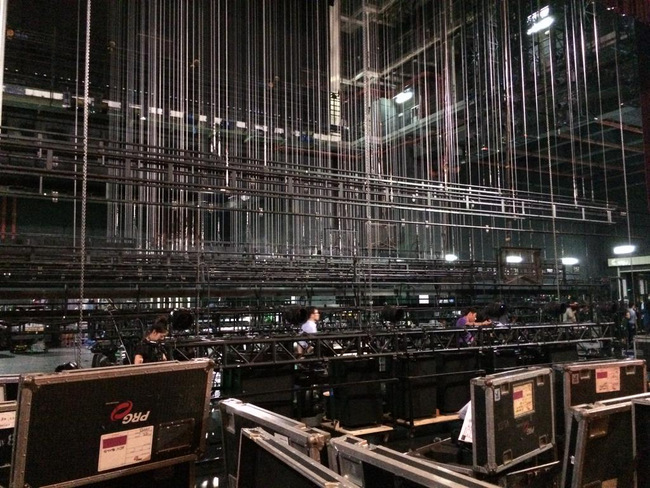 Back in Shenzhen, China where the crew was working hard to bring the set to life. 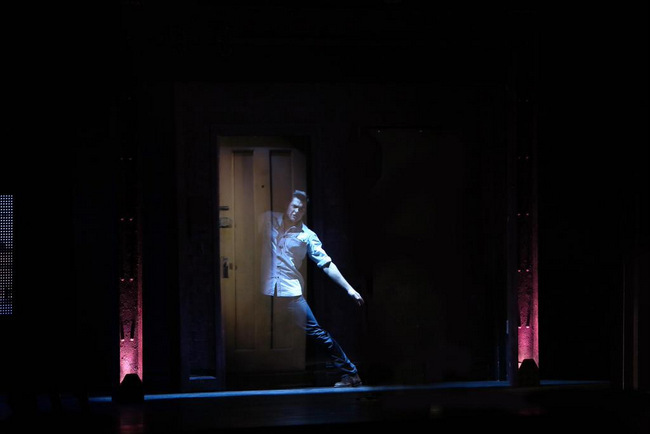 Credits: Ghost The Musical Twitter. There are a lot of scene changes, from the Subway, City Streets and to their home. It must have been a huge challenge to bring that onto the stage. Liam: Definitely, and it’s because we have Matthew Warchus as the director. He has made it very cinematic to watch. Andrea: Ghost is really ahead of its time and is setting the bar for other musicals in how technology is used. We have two of these “screens” which are about 6,000 pounds each! They are crazy expensive, wild and amazing. They come down as thousands of little lights where you can project video – whatever you want – on them. There’s one bit where Sam is following people, and the video will change as he is walking. It is really like the movie in that way! Liam: I don’t know any other musical that uses that on the scale that we do. Was it difficult to rehearse when you are surrounded by so much technology in the background? Liam: When we actually learnt the show, we had three weeks of rehearsals without any tech. The most important part was to lock the story in first because it is so strong and everything else is just adding a layer on top of it. We were in a room with just the mark up of the stage. Then, we had two days of tech – which was crazy! So, it that kind of thing where as an actor where you just fit in between it. You just don’t think about it and commit to the story in your head. If you start thinking about everything going on behind you, you’d have a panic attack! Moving on to the music. On top of the iconic songs, there are also original tracks for the musical as well. Liam: Obviously, we have to have Unchained Melody in Ghost. I don’t think it would have worked without it. Basically, what they have done with the song was to split it into little bits and you hear it throughout the show. The pottery scene is there, which is what everyone wants to see. But, that’s done in a slightly different way – on purpose. Something which I actually prefer for the show. Everything from the film, we’ve got. But, we have also got new tracks from Dave Stewart and Glen Ballard. And, they are out of this world. Andrea: They are some of my favourites to sing. They are all gorgeous music telling such a beautiful story. You can really take it away from the show and play it on radio. And, with you (Liam), it IS a popular song on the radio. Liam: It’s like a hit. In the UK, it is actually the Top 10! Andrea: And, going back to the subway ghost. When Sam seeks him out to learn how to do physically manifest anger to try and protect Molly. he actually teaches in a Rap! Liam: It really works though! Andrea: Yes, and it is really neat. The ghost, Stevie Hutchinson is great (he just got off Cats). He bounces across the stage and moving around seemingly weightless, making you really think he is a ghost. It is one of my favourite parts of the show and I think you would like it. 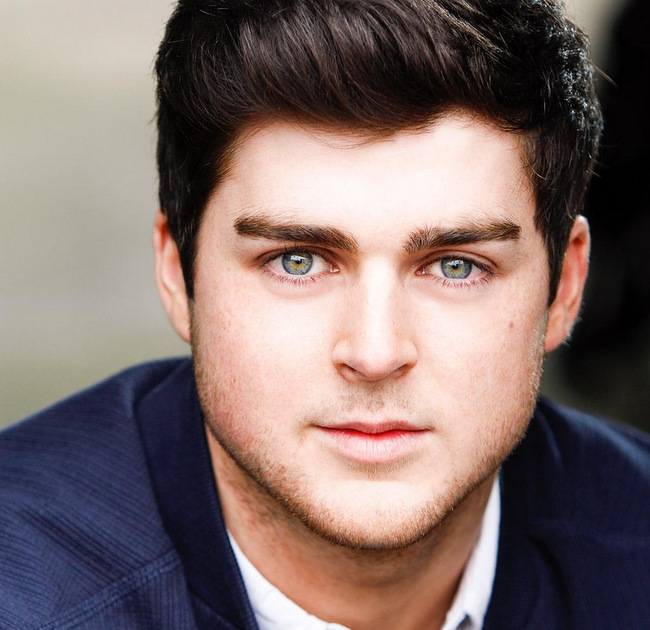 Liam Doyle as Sam Wheat. Credits: GWB Entertainment. So, when was the first time you actually watched the movie? I was actually a kid, and probably should not have watched it. Andrea: I know! That’s what I’m thinking as you asked the question. I think I was in sixth grade, but I definitely watched it again after seeing it on Broadway and when I was cast in the US tour. Liam: I watched it the day after I was cast in the show. I was like, “I should really watch it.” The thing about me is that I am glad I didn’t watch it or remember exactly, because I did not want to feel like I was copying Patrick Swayze. He is amazing, and me recreating what he did may not have been great for me as an actor because we are very different people. What I took from the film was what he brought to Sam – the energy, the positivity and the drive. 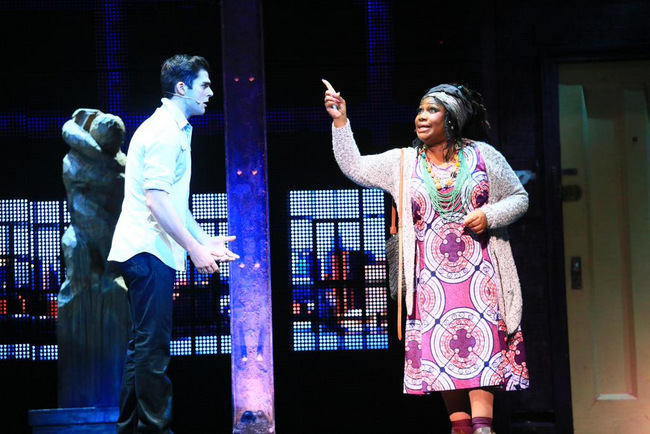 Liam Doyle and Wendy Mae Brown in Ghost The Musical. Credits: GWB Entertainment. How excited are you guys feeling about bringing the piece to Singapore? Liam: We’ve only been here a day and we want to live here! Andrea: This is one of my favourite cities. We have both been touring around, and on separate tours. We genuinely love Singapore and what we’ve seen from it. Have you managed to check out the island despite your schedules? Liam: We glanced at it last night, 7PM when we went to Raffles and had a Singapore Sling. We took a cab here (MBS), and we walked back to where we were housed. But, it’s really hot here! Andrea: But, we love it here. The architectures is gorgeous, the people are friendly, the food’s great, the shopping too. We are really excited to be here. Liam: And, we need to have chilli crab! Let’s not hold you back any longer! Is there anything else you would like to share with our readers? Liam: Come see Ghost The Musical, and prepare to be completely amazed. I was when I first saw it. There’s nothing like it. It doesn’t matter if you have seen the film or you hadn’t. 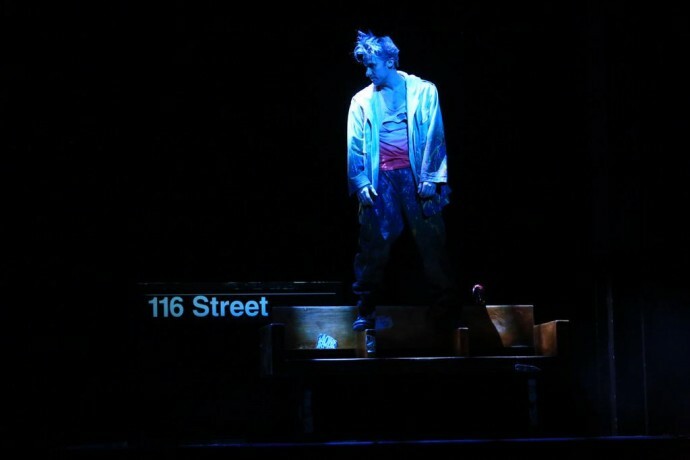 If you hadn’t, you get to see this incredible story on stage. If you have seen the film, you get to see something new; everything you love about the movie plus more. I would like to thank Liam and Andrea for being such good sports in answering all my questions with such enthusiasm. I am all pumped up to check out Ghost The Musical, and here’s hoping that they check out more of Singapore and fall more in love with it!